The Boston Red Sox' 2003 season included the Red Sox attempting to win the American League East division, the ALDS, and the American League pennant. The Sox settled for the AL Wild Card and entered the first round against the Oakland Athletics. Despite losing the first two games in Oakland, Boston rebounded with two dramatic wins in the late innings at Fenway Park to even the series. When the series returned to Oakland, the Red Sox held off a late Oakland charge to win the series in five games. In doing so, they joined the 1995 Mariners and 1999 Boston Red Sox as the only teams to come back to win a best-of-five ALDS since the playoff expansion in 1994. The stage was set for a classic showdown with their longtime division rival New York Yankees. The teams split the first two games in the Bronx before the real drama unfolded in Game 3 at Fenway Park. A highly anticipated matchup between Sox ace Pedro Martínez and former Sox' pitcher Roger Clemens turned ugly early on. Karim García was hit in the back by a Martinez fastball. Words were exchanged and Martínez threateningly gestured towards Yankee catcher Jorge Posada. When Garcia was forced out at second, he slid hard into Todd Walker. The following inning, Manny Ramírez took exception to a high Clemens pitch and charged the mound. Both benches cleared, but the resulting brawl turned surreal when 72-year-old Yankee bench coach Don Zimmer charged Martínez. Pedro sidestepped and threw Zimmer to the ground. After the thirteen-minute delay, Clemens struck out Ramírez and proceeded to pitch effectively as the Yankees took a 2-1 series lead. The Red Sox won Game 4, but the Yankees won Game 5 to takes the series' lead back to New York. But Boston proved resilient, and their offense came alive for the first time in the series to the tune of nine runs on sixteen hits to force a seventh game. With a 4-0 lead early on and Martínez, Boston appeared to be on the brink of winning the pennant. But more late-inning drama unfolded when the Yankees tied the game with three eighth-inning runs off Martínez, sending the game on into the October night. Yankee closer Mariano Rivera pitched three scoreless innings, and in the bottom of the eleventh, Aaron Boone turned on the first offering from Tim Wakefield and sent it into the frenzied bleachers of Yankee Stadium, sending the Yankees on to the World Series for the fifth time in six years. This game further cemented the legend many believed was The Curse of the Bambino. Despite the crushing loss, all was not lost on the Red Sox' season. They led the Major leagues in nearly all offensive categories, including runs scored (961), batting average (.289), on-base percentage (.360), and perhaps most impressively, a .491 team slugging percentage, which set a new record previously held by the 1927 Yankees. On November 25, 2002, Theo Epstein, 28, was hired as General Manager of the Boston Red Sox. The vacancy occurred because Oakland Athletics General Manager Billy Beane accepted the Red Sox job and then resigned shortly afterward. Epstein's hiring made him the youngest general manager in major league history. Larry Lucchino, Red Sox' President and CEO, wanted Epstein to be hired. Prior to the appointment, Epstein was Boston's assistant general manager. October 9, 2002: Brandon Lyon was selected off waivers by the Boston Red Sox from the Toronto Blue Jays. November 6, 2002: Chris Coste signed as a Free Agent with the Boston Red Sox. December 6, 2002: Wayne Gomes was released by the Boston Red Sox. December 31, 2002: Ramiro Mendoza signed as a Free Agent with the Boston Red Sox. January 10, 2003: Bill Mueller was signed as a Free Agent with the Boston Red Sox. January 22, 2003: David Ortiz was signed as a Free Agent with the Boston Red Sox. February 15, 2003: Kevin Millar was purchased by the Boston Red Sox from the Florida Marlins. 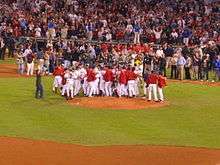 The Red Sox celebrate their clinching of the 2003 AL Wild Card with a victory over the Baltimore Orioles. April 11, 2003: Bill Haselman signed as a free agent with the Boston Red Sox. 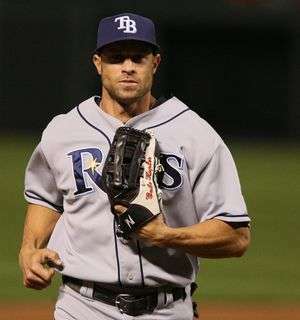 June 28, 2003: Gabe Kapler was purchased by the Boston Red Sox from the Colorado Rockies. July 22, 2003: Scott Sauerbeck was acquired by the Red Sox from the Pittsburgh Pirates. July 31, 2003: The Red Sox acquired Scott Williamson from the Cincinnati Reds. Freddy Sanchez was traded by the Boston Red Sox to the Pittsburgh Pirates for Jeff Suppan. August 5, 2003: David McCarty was acquired off waivers by the Red Sox from the Oakland Athletics. 1 2 "2003 MLB Summary". Baseball-Reference. Retrieved August 22, 2015. 1 2 Shpigel, Ben (November 1, 2005). "Red Sox General Manager Ends a Memorable Run". The New York Times. Retrieved April 21, 2010. ↑ "2003 ALCS Game 1 – Boston Red Sox vs. New York Yankees". Retrosheet. Retrieved July 1, 2008. ↑ "2003 ALCS Game 2 – Boston Red Sox vs. New York Yankees". Retrosheet. Retrieved July 1, 2008. ↑ "2003 ALCS Game 3 – New York Yankees vs. Boston Red Sox". Retrosheet. Retrieved July 1, 2008. ↑ "2003 ALCS Game 4 – New York Yankees vs. Boston Red Sox". Retrosheet. Retrieved July 1, 2008. ↑ "2003 ALCS Game 5 – New York Yankees vs. Boston Red Sox". Retrosheet. Retrieved July 1, 2008. ↑ "2003 ALCS Game 6 – Boston Red Sox vs. New York Yankees". Retrosheet. Retrieved July 1, 2008. ↑ "2003 ALCS Game 7 – Boston Red Sox vs. New York Yankees". Retrosheet. Retrieved July 1, 2008.